Zooplankton from 87 stations in the Bering, Chukchi and Beaufort Seas sampled in 1985, 1986 and 1987 showed a geographic gradient in stable carbon-isotope ratios (δ13C). The zooplankton most depleted in 13C were found in the central and eastern Beaufort Sea and those most enriched were from the Bering and Chukchi Seas. Average δ13C values ranged from-20.9 to-26.7‰ for copepods and from-19.4 to-25.1‰ for euphausiids. Euphausiids show a minimum of 1.0‰ enrichment relative to copepods throughout the study area. 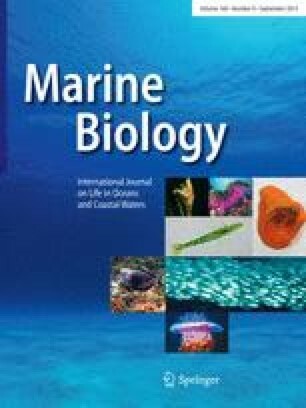 Relative biomasses of the major zooplankton taxa varied significantly across the Alaskan Beaufort Sea in October 1986, with euphausiids dominating in the west and copepods in the east. These differences in taxonomic composition affected the weighted δ13C values for “total” zooplankton and may produce an even more pronounced geographic gradient in zooplankton δ13C than that found within a single taxon. The bowhead whale Balaena mysticetus migrates between wintering areas in the Bering Sea and summering areas in the Beaufort Sea and feeds over this geographic range. The zooplankton δ13C gradient is the probable source of δ13C oscillations found along the baleen plates of this planktivore.